I was reading one of my Bible devotional plans called New Day New You by Joyce Meyer. She said, “We tend to be so heavy about everything- our sin, expecting perfection from ourselves, our growth in God, our prayer life,…”. I would add to that – our worries, fretting what others think of us, worrying how they will take what we said or did, stressing about our home(cleaning/remodeling/decorating), stress at work, stress with our relationships, the list could go on and on on all the things we stress over. Joyce talks about be purposefully in being of good cheer and laughing. I can see that. It is easy to focus our energies on all the negative in the world and in our life that we forget to laugh. For me, my kids provide a ton of laughing opportunities with all they say and do that cracks us up. I even keep a journal for each of them of the funny things they say so we can retell them for future laughs. Many times in my parenting I can choose to cry or laugh with particular situations. Choosing to laugh at the ridiculous situations(like potty training, being puked on, etc…) saves my sanity. Jeremy and I pretty much always have some sitcom or netflix series that we are watching that we can laugh together about. But I could laugh more. I don’t feel like a get enough serious episodes of laughter where my side hurts from laughing or my face muscles hurt from smiling so much. It feels so good to laugh really hard that you can’t breathe. I want to try to laugh more. One way for me is to watch favorite comedians like Jim Gaffigan. His parenting stuff kills me!!. I also think it would be fun to go to a live comedy show for like a date night or a friends night out. hopefully in 2013 :). But I am not going to stress over it or add it to a to do list. I love my kids expressions. 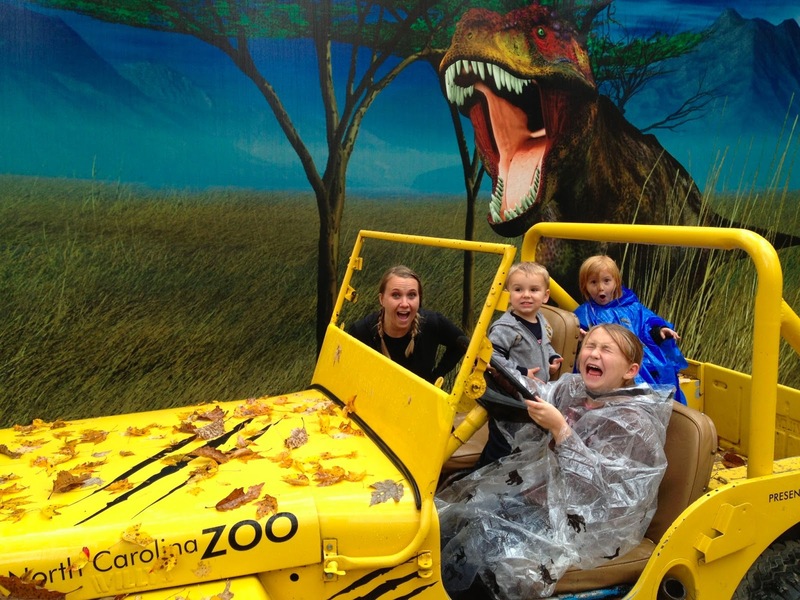 We wanted to take a silly picture like we were really driving to escape a TRex. They make me laugh.